I have two things for you guys today: 1) an awesome date idea, and 2) some big news! Klondike Penny's is an awesome old time photo studio a few blocks away from us in Pioneer Square. I've been asking Brad to get old timey photos with me for years, so for my birthday last month he gave me a super sweet "coupon" for a photo adventure! 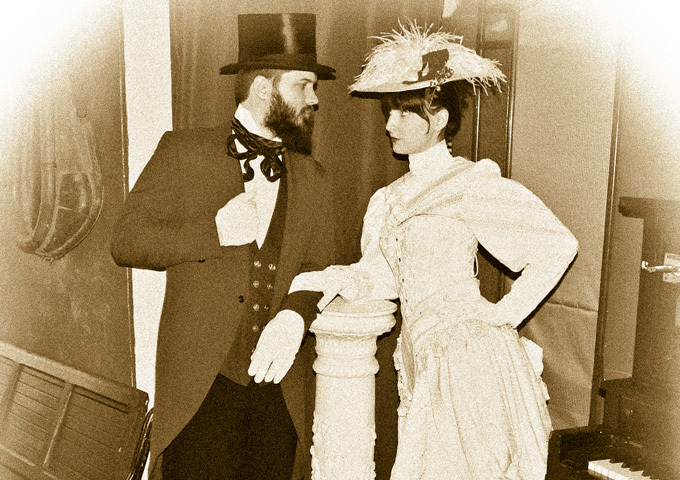 I redeemed my coupon this weekend, and we had so much fun playing dress up in their gold rush era costumes! It was like stepping right into Pioneer Square's past. Can you imagine me operating a printing press in this dress? Too funny. Now here's the extra exciting part: the great folks at Klondike Penny's are looking to expand the mercantile section of the shop and have given us the opportunity to join them! Their shop is a such a great fit with the era of our presses and the feel of our products that we've agreed take them up on the offer! A large selection of our products will be available for retail purchase at Klondike Penny's just in time for art walk this coming Thursday. If you're here in Seattle, make sure to come out and buy something for your sweetie!